This is one of the Ye family’s most compelling late masterpieces. It comes as a surprise so late in a career full of repetitious subject matter, since it is a unique subject and composition. The style is entirely borrowed from Zhou Leyuan, as was so much of Ye’s landscape style, and the debt is clear to see. Here we have the same lofty view from a rocky promontory with a mature pine and peonies growing alongside lingzhi, which allows us to look down upon a distant landscape as we did in Zhou’s works, Sale 2, lot 41, and Sale 2, lot 66, but instead of a single crane, Ye has painted eight, an unusual and perhaps unlikely number. Given the auspicious nature of the number nine it is perhaps surprising that Ye didn’t add one more, but there must have been some significance in the number eight. It may be that eight (ba) cranes (he) is a rebus for the term bahe, which signifies the concept of peace and harmony throughout the country. He means harmony, and ba, or eight, stands for bafang, or eight directions, the eight points of the compass (north, south, west, east, northeast, southeast, northwest, and southwest). Painting so many birds forced Ye to be more inventive than he usually was, and the result is spectacular. 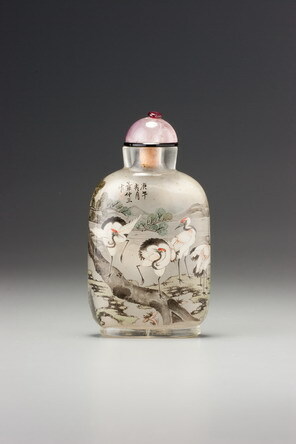 The cranes, each in its starkly contrasted opaque white colour with detailing in black and red, are superbly composed around the body of the bottle like the characters in a fine calligraphic work, each powerful in its own right, but each comfortably balanced formally with all the others. The opaque colouring of the cranes is cleverly contrasted against the translucency of the other colours and ink washes, and it is one of the features that make this painting so successful, quite apart from its obvious impact as a fresh and powerful subject. It is also in studio condition, which adds enormously to its appeal, since the white is so easily damaged that it might have suffered the same fate as so many other inside-painted bottles with a heavy reliance on white pigment. We have been commenting as if Ye himself painted this bottle, but of course, while we would like to believe that a masterpiece of this sort must have come from the hands of the master, there is no evidence to support this and some to suggest quite the opposite. 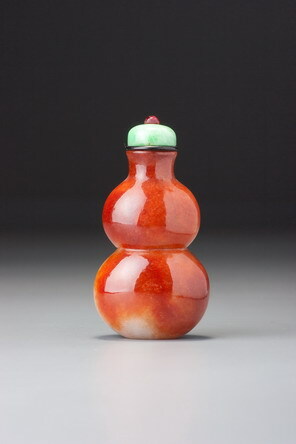 When Ye Bengqi was shown hundreds of photographs of family works by Moss in early 1974 in order to try to distinguish his works from those of his brothers and his father, he made it quite clear that works in Zhou Leyuan’s style were also a speciality of his elder brother Ye Xiaofeng, and that he might have painted a bottle such as this. Whoever painted it, it is one of the great masterpieces from the family years, and stands as one of the most impressive bottles ever produced by any of them, including the early Ye Zhongsan.